Megagames are large games involving teams of players. The subject matter can range from politics, economics, history, science fiction and heroic fantasy. Much of what goes on might be described as roleplaying - though there is also a large element of problem solving, strategy, negotiation - and of course, humour. 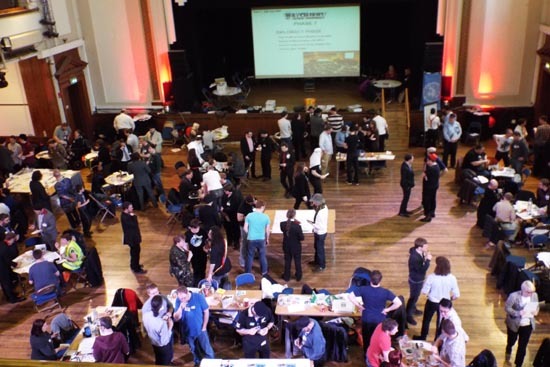 Megagame Makers is a loose association of game designers who club together to set up and run these events. Browse through the buttons on the left to find out more. Viji has left the admin role to focus on her full time job. The members of Megagame Makers greatly appreciate and wish to express their thanks for all Vijis hard work and enthusiasm  she will be a hard act to follow. Brian Cameron, one of the designers who make up MM, took on the role. Dave Boundy has now replaced him. The email contact address remains the same. Please note that the admin is not able to reply to any queries about the games  these will, as historically, be passed on to the designer for a reply. Please also note that megagames are a hobby activity which has to be fitted in around work, family, holidays, etc. As a result, the email account is not monitored all the time so it may be a day or two before you receive a reply. Those great guys at Shut Up And Sit Down came to our first "Watch The Skies!" megagame and made a video of their experience. here it is! They then came to Watch the Skies 2 - and made two videos! Part One and Part 2!